Django, the Python–based equivalent to the Ruby on Rails web development framework, is hottest topics in web development. 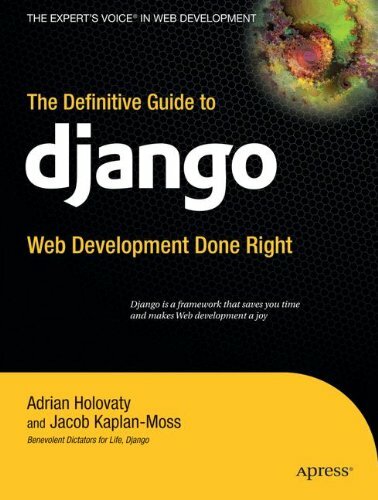 In The Definitive Guide to Django: Web Development Done Right, Adrian Holovaty, one of Django’s creators, and Django lead developer Jacob Kaplan–Moss show you how they use this framework to create award–winning web sites. Over the course of three parts, they guide you through the creation of a web application reminiscent of chicagocrime.org. The first part of the book introduces Django fundamentals like installation and configuration. You’ll learn about creating the components that power a Django-driven web site. The second part delves into the more sophisticated features of Django, like outputting non–HTML content (such as RSS feeds and PDFs), plus caching and user management. The third part serves as a detailed reference to Django’s many configuration options and commands. The book even includes seven appendices for looking up configurations options and commands. In all, this book provides the ultimate tutorial and reference to the popular Django framework. The first half of this book explains in-depth how to build web applications using Django including the basics of dynamic web pages, the Django templating system interacting with databases, and web forms. The second half of this book discusses higher-level concepts such as caching, security, and how to deploy Django. The appendices form a reference for the commands and configurations available in Django. Anyone who wants to use the powerful Django framework to build dynamic web sites quickly and easily!